If you have forgotten your password, you can request for it to be reset and emailed to your email address that we have listed for your account using the Forgot Password/UserID link. If you have forgotten your userid, you can retrieve it by submitting your email address that you registered with using the Forgot Password/UserID link. My original email has changed, and I cannot log in to change it. Contact us via email or phone to have us review and update your account information. Can I add a region? Yes, you can add a region at any time. Once logged in, navigate to the acct info page. Then click add region and follow the instructions. Note: the new region fee will be charged immediately using the credit card on file. Also, additional regions will renew on the same date as your original region. I have multiple computers and devices. Can I log into RipCharts on all of them? Yes, we have made allowances for you to access RipCharts on multiple devices. May I share my account with others? No. We do monitor and restrict certain scenarios that resemble password sharing. We believe that we have priced our service reasonably, so rather than sharing an account please suggest to your friend to get their own account. How do I add a waypoint? You can either right click on the map (ctrl+click on Macs) or click the "Add Waypoint" link in the blue dashboard. Are waypoints I add viewable by others? No, custom waypoints that you add are only visible within your account and not available to others. What is the projection and datum? RipCharts maps are built with the Microsoft Bing Map platform, which utilizes the Mercator projection and WGS84 datum. This is the same coordinate system that your GPS uses, therefore you can reference or copy GPS coordinates without needing a conversion. We suggest that you click the print button that is located on the map's blue dashboard. This will load a custom 8.5 x 11 inch map that will print out on a piece of paper. Sometimes the default page margins, header, or footer will encroach upon the map and can prevent it from printing properly. In this situation, we suggest that after you click the print button, you click "Cancel" when the print dialog pops up. Then select File > Print Preview. At this point you can shrink the margins, remove the header, and remove the footer. Then click print. This should yield a nice print out. Granules are rectangular segments of data that have been acquired during a satellite's orbit of the earth. Satellites orbit along a different path each time, so the area of coverage from each orbit is captured in a granule. Why are some maps blank or partial? The high resolution satellites from which we obtain data are low earth orbiting satellites. As they orbit the earth, they are capturing data and transmitting it down to receiving stations. Images may be (mostly) blank if the satellite’s capture area is over land and not the ocean. We process all datasets that have data within our predefined region. On some occasions the area that was captured is over land, and does not contain any data values of the ocean. Why is data missing on the map? Atmospheric impurities can prevent the satellites from obtaining a clear view of the water surface and obscure the ability to capture data.  This scenario can impact Sea Temperature, Chlorophyll, and True Color maps. Atmospheric impurities may include clouds, fog, smoke, or steam. Additionally, on some occasions, the angle of the sun can cause a reflection/sun glare on the water surface. This can prevent the satellite from acquiring data. Historical Data: It can be helpful to look back a few days to see if clearer shots were available. If so, you can identify key water features such as rips, temperature changes, and color changes. Once you know the approximate location of a feature, you may be able to verify it's location or the direction it is moving with a more recent granule that has more cloud cover but still may reveal small portions of the water feature you are interested in. Composite Compilations: During times of intermittent or persistent cloud cover, it can be helpful to view our custom processed Daily Summary and 3Day Composite maps (sst and chlor). These maps compile available data fragments for the last 24 hours (daily summary) or last 3 days (3day composite), and can give a good indication for where water features reside. Cloud Free Datasets: We have several datasets that are not impacted by clouds. These include Altimetry, Bathymetry, Currents, and Cloud Free/Multi Resolution Sea Temperature maps. Do you have a dedicated mobile app? Yes, we have dedicated iOS and Android mobile apps available for Premium members. Is there a tutorial on using the mobile app? Yes we have a tutorial that describes the features of the mobile app. Can I navigate on saved maps while offshore and offline? I can only see the mobile site on my mobile device. Can I see the full site? Yes, there is a full site link at the bottom of the mobile pages, this will take you to the main site.